In his years as an advertising executive and copywriter, Ogilvy created some of the world’s most successful and iconic marketing campaigns, including the legendary Man in the Hathaway Shirt, plus notable efforts for Schwepps, Rolls Royce, and the island of Puerto Rico among many others. As content marketers, we can learn a lot from the legendary Mr. Ogilvy. He was, after all, one of the pioneers of information-rich, “soft sell” ads that didn’t insult the intelligence of the prospect. For example, consider The Guinness Guide to Oysters, an early form of what the kids are now calling native advertising — from 1950. We can study Ogilvy’s successful advertising campaigns to learn how to persuade prospects, influence readers, and create memorable, evergreen content. But “The Father of Advertising” also has plenty to teach us about productivity, branding, research, and ambition. 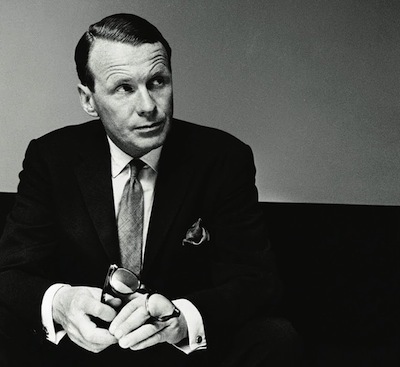 Let’s look at some things David Ogilvy had to say, and see what we can learn from each of them. Cleverness doesn’t sell products and services. Original thinking in marketing is great, but not just for the sake of being witty or clever. If you aren’t thinking about connecting with your audience, building trust and selling your products or services when you sit down to write marketing copy, you need to reexamine your motivations. Don’t just create content to get credit for being clever — create content that will be helpful, insightful, or interesting for your target audience. Big ideas come from the unconscious. This is true in art, in science, and in advertising. But your unconscious has to be well informed, or your idea will be irrelevant. Stuff your conscious mind with information, then unhook your rational thought process. You can help this process by going for a long walk, or taking a hot bath, or drinking half a pint of claret. Suddenly, if the telephone line from your unconscious is open, a big idea wells up within you. I like the idea of “stuffing your conscious mind with information” in this quote. Ogilvy wholeheartedly believed in research, and he was always prepared before sitting down to write. Learn everything you can possibly know about your topic (and your audience) before you write — then unleash your unconscious mind, and see what bubbles up. If you have all the research, all the ground rules, all the directives, all the data — it doesn’t mean the ad is written. Then you’ve got to close the door and write something — that is the moment of truth which we all try to postpone as long as possible. Bottom line — inspiration comes to those who keep butts in chairs. We all avoid the “moment of truth” to some degree, and dealing with resistance and procrastination is part of the writer’s life. Ogilvy’s contemporary, Eugene Schwartz, had a simple technique for eliminating distraction — he worked in blocks of 33 minutes, using a timer to structure his writing time. Don’t be afraid to use techniques like this to get to that moment of truth. Think different — the best thinkers often do. It is vitally important that we research and understand how our prospect think, speak, and search, so that we can use that language in our headlines, blog posts, sales letters, and ebooks. The better we understand how our readers think, the better we’ll be able to connect with them (and persuade them). If you’ve done the research to understand what your audience needs (and the language they use when they’re speaking about your topic), you’d be a fool to ignore that information. Use it and every way you can, and let your research shape your decisions about your content, sales letters, products, emails, and social networking campaigns. Our online world gives us hundreds of ways to test the effectiveness of our copy and messages. Make sure you’re making use of those testing methods on a regular basis, and always remember that the more you test, the better your writing will be. Do not … address your readers as though they were gathered together in a stadium. When people read your copy, they are alone. Pretend you are writing to each of them a letter on behalf of your client. Sometimes as writers, the idea of trying to connect with a large audience is troubling. Just like public speaking is often more intimidating than talking to someone one-on-one, writing for a group can be tough. But Ogilvy’s advice — remembering that when each person reads your post, they are alone with your words — can help you get past the overwhelm and allow you to really connect with your reader on a personal level. There isn’t any significant difference between the various brands of whiskey, or cigarettes or beer. They are all about the same. And so are the cake mixes and the detergents, and the margarines… The manufacturer who dedicates his advertising to building the most sharply defined personality for his brand will get the largest share of the market at the highest profit. You want your produce or service to have a unique selling proposition — a public personality that defines who you are and what you do. And as Ogilvy and other advertising executives remind us, the more sharply defined that personality is, the more successful you will be as a content marketer. Here at Copyblogger, we continually stress the importance of writing great headlines, and this statistic from Ogilvy just reminds us of of how critical headlines really are. Make sure to continually hone your headline writing skills to lift your blog posts and sales letters to the next level. Never use tricky or irrelevant headlines… People read too fast to figure out what you are trying to say. Simple headlines are better. Always remember that on average, 8 out of 10 people will read headline copy, but only 2 out of 10 will read the rest of the piece. If your headline is confusing, tricky, or awkward, they won’t continue reading. Play to win, but enjoy the fun. Remember to keep things in perspective — even on our worst day as content marketing professionals, we’ve still got one of the best jobs in the world. We get to do something amazing every day — create killer content for audiences who really need it and want to share it. Let’s make sure that ambition doesn’t crowd out true enjoyment of our craft. This is my favorite Ogilvy quotation. What we do in our day-to-day lives might occasionally seem mundane, but remember this — every day, we are giving the opportunity to make a difference. To teach, to stimulate conversation, to persuade. So aim high. Make sure you’re always thinking, how can I make more of a difference? How can I think bigger? Ogilvy’s work continues to inspire us, and his world-famous marketing campaigns live on. But some of Ogilvy’s best lessons are about how he approached his creative life, and how he aimed for greatness instead of settling for second best. Who are your marketing heroes? Who inspires you to work harder, dream bigger and aim out of the ball park? David Ogilvy was the Seth Godin of his time. I had the honour and pleasure of working for Ogilvy & Mather in the late 90’s. It is the best advertising company in the world and it was the most creative and unusual place I ever worked. I should have stayed longer. But it was my first “office job” and I didn’t know how great it was. Wow, Keith! I would absolutely love to know more about what it was like to work there! Have you written about it on your blog (or anywhere else)? Thanks for commenting! My stint there was awesome but earlier. Everything that was ever fun in business I learned as an Art Director/Copywriter in NY. And it’s all true. Great insights Beth! I love David Ogilvy’s quote about the subconscious. We need to inform our conscious so our subconscious can be unleashed to communicate effectively. We aren’t writing research papers! Lots of inspiration here, even for novelists like me! D.O. is one of my favorite advertising minds, such a great blend of the practical with an artistry that took things to a different level. A great list – I think this is pretty timeless as, despite the technology advances, advertising’s still all about winning over human emotions. What seems to work at the moment is cute and surreal things mixed with songs from yesteryear; note the success (in the UK anyway) of the dancing Shetland Pony advert to the setting of Fleetwood Mac’s Everywhere. Or, over in the USA, the success of Oreo’s social media campaigns. Innovation and intelligence is key! These are wonderful quotes. As I always thought, Ogilvy had a common sense approach to marketing which transformed selling a message into an artform. I try to carry this over into the digital realm, not always easy but I enjoy the process. I copied and pasted this post into my Evernote. Thanks! I loved the quote about writing because content is usually written for the masses. The quote from David is a great reminder to write content for an individual. After all, we are individuals. But, we collectively read content too. One of my marketing heroes is Madonna. She’s reinvented herself several times and still creates buzz. Plus, younger pop stars have copied or piggybacked on her success. Madge knows how to market and could teach a sales and marketing course. Agreed, Amandah! The woman knows how to sell! Ogilvy’s ‘Confessions’ was the book that taught me copywriting. All my awards and most of my career I owe to DO’s writings. Thank you for bringing this to light for me! I immediately ordered a copy of Ogilvy On Advertising. Despite a raging recession in the 70’s, I was able to attain an interview despite having only a newly minted MBA coupled with a passion for product development and promotion. My ploy was to send a message in a sealed bottle relating a tale of being marooned in the boondocks of NJ. It worked however the gal in charge of HR was nasty as she sat me down for the interview. Obviously I had avoided her usual channel. My end of the interview went well (to her dismay). My year old thesis ad campaign that prophesized Mercedes SUV’s had proven very prescient. She sensed this and then abruptly threw out the “would you like a cigarette” card which was just becoming an interview faux pas at that time. “Well”, I said to myself, “If she is to reject me, let it be for the inane. “Sure” I said. “A smoke and a claret makes for great conversation”. She finally smiled thus sealing my fate. There would be no Madison Ave in my future and perhaps it was the best thing to happen for someone too entrepreneurial for the large corporate world. Great interpretations from a `master`Beth. So many tend to chase what is `new`or working best at the time and lose sight of the basics of great writing and sales. Looking back at some of the great writers and advertisers, we can see that not much has really changed. A good reminder to truly understand `who you are writing to`and `speak in their language`. I like the quote about the headlines the best. It’s true everyone does this. We scan headlines and if it’s interesting then we’ll take a further look. This is also why it’s important to put your juiciest content at the beginning of the article to keep the reader interested. I also like what he says about greatness it is critical to have fun, I think people take waaaay too much waaay too seriously. Life’s too short. My favorite is “play to win, but enjoy the fun”. I might need to hang this in my office! I have bookmarked this link to go back to it for inspiration. A great read for a sunny, Friday afternoon. Thank you! I’m currently in the middle of “Ogilvy on Advertising,” and it’s absolutely amazing (which includes some of the quotes you mentioned plus many others). It also has a series of ads Ogilvy did for his agency that look like a very early form of content marketing. His reasoning for those ads it priceless and useful to anyone who’s interested in content marketing. What did he say, you ask? He said that the point of the ads was to convince people that he and his agency knew a lot about advertising. That’s great advice for content marketing. Hi Joseph – I’m curious about this….I need to go and dig up my copy of Ogilvy on Advertising. Didn’t Ogilvy usually say that the sole purpose of an ad was to convince the reader to buy? I’m curious why he would have a different purpose for the ads that you mentioned here….? The ads create for Ogilvy Mather were designed with that goal in mind. Awesome post! And I couldn’t agree more with the idea that posts need to meet the needs of the audience first and showcase the talent of the writer second. Wow, words of wisdom. I’m a big fan of David Ogilvy. Thanks for sharing the inspiring quotes and lessons here. I have spent the better part of 20 years in Advertising and Marketing and now have set forth on the Road Less Traveled, at least for me. I am creating what I hope to be a successful destination blog called Art of Adventure.Net. I have always respected David Olgilvy and his teachings. Thank you for reminding us of this great man and his insights. “…use their language… ” I did – it worked ! Thanks for this great post!! So much great advertising wisdom in this post! Ogilvy was so ahead of his time! It’s time for us to take the wisdom he has passed on and create our own legacy. I Ogilvy really is the “Father of Advertising” then what does that make Claude Hopkins, John E Kennedy and Albert Lasker? The Grandfathers of advertising? I love your site. Thanks for sharing. Awesome ideas from the history and a inspiring personality. the words made me think, why does it really mater to be unique or give something that world otherwise couldn’t find. Yep… It’s that “moment of truth” bit that gets me every time. I’m ashamed to admit that I’ve never heard of this man until I read your post. Now I have a new obsession. Thank you. David Ogilvy has surely left us with something so precious and useful that we can literally use for decades to come. I too like “stuffing your conscious mind with information” as much as you do. A well-fed mind in itself is a universe from where ideas emerge. Great timing Beth! I just got back from vacation feeling a bit relaxed and inspired. This helped set my mind to get back in the swing of getting things going again. I’ve been meaning to read “Oglivy On Advertising” and just placed my order. Thanks! I’m not sure which of these categories I fit in. I wonder what Ogilvy would think of Mad Men… Fascinating stuff. A very useful post Beth. All the points are valuable but I believe the two most important points are “Standing out” and “Research and Testing”. It is so important to have a unique personality as a content marketer. Thats the only way people can relate with you and join your community. Not one of Ogilvy’s, alas. I think it was GK Chesterton. Simply excellent. No words can explain that how much I liked reading these life changing lessons. Thanks a lot. Thanks for the post. I think these quotations pretty much tell you most of what is important about content writing. I might pin it to my office wall. Some great links too. You’ve only just scratched the surface, but what you’ve shared ought to drive many to find out more. You’ve selected some classic gems from the treasure that is David Ogilvy. So much more awaits the inquisitive mind! Thanks, from an old school Madmen kind of guy. Brilliant post – especially the emphasis on headlines. 80c of each dollar should go towards the headline which is why this is always the last piece I work on before going live. I personally write my headline last, because it takes so much tweaking that it is often the hardest thing to write. Check out these articles for more information on writing great headlines, and make sure you sign up for Authority, too! Who would you say is the David Ogilvy of our time? Lee Clow – check out “Leeclowsbeard” at Amazon. Great post. I see how this applies to the iPhone. Apple advertized the iPhone as “”If you don’t have an iPhone, well, you don’t have an iPhone.” I couldn’t make much sense out of it. But if you think about it…it tells you that the iPhone is a brand on its own. Its seems to imply that if you don’t have an iPhone then you are missing out on something. Talk about “it’s not creative if it doesn’t sell” and here is the example of something that sells but it doesn’t have anything that you were terribly missing out on that you didn’t have before. Great to get the insights from perhaps the greatest marketer of all time. The ideas seem to be so simple, yet most of us tend to miss them in the bigger realm of things. Loved reading the post. The author is truly gifted, how he incorporates ideology and business in a way to that seem to blend together. I really like the honesty and deep thought process that was practiced and implemented.. Ogilvy had a really nice selling tactic; the laid back soft sell approach similar to that of Edward Bernays; the father of public relations. They both seemed to aim there efforts and the emotions of their audience, which has proved to be very useful in sending the point across. I especially like the free- thinking promotion, there isn’t a lot of people passing out encouragement these days. Great article, definitely two thumbs up! Really loved this line “inspiration comes to those who keep butts in chairs”, that really very much true. Thanks for this wonderful post. “Cleverness doesn’t sell products and services. Original thinking in marketing is great, but not just for the sake of being witty or clever. If you aren’t thinking about connecting with your audience, building trust and selling your products or services when you sit down to write marketing copy, you need to reexamine your motivations. There is nothing better than learning from the best and this honest, thought provoking advice helps us do just that. the quotes on creativity are particularly poignant as this, for me, is the most integral part of advertising. “Don’t just create content to get credit for being clever — create content that will be helpful, insightful, or interesting for your target audience. ” This quote really showed me again what everybody should be focusing on: content is king. to be successful, you have to create outstanding content of great value. thanks for the new insights! I thoroughly enjoyed this piece because I had the privilege knowing Mr David Ogilvy and working in his company for 25 long years. Yet every time I read his quotes, it seems so fresh, and eternally relevant. Thanks for this piece. It is back to basics but important. On the business of generating ideas ‘unhooking from your rational thought’ is the most difficult one. Getting out of habitual thinking is tough! David Ogilvy is a BOSS! Sports analogies and metaphors are tricky, because not all countries share your love of sports; or they tend to play different sports. American baseball is not played by most countries and in most cultures, so such a turn of phrase would be hard to understand once you leave the U.S. In a world that in increasingly global, this is just something to keep in mind. Otherwise, a brilliant post: I really appreciate your effort here. Thanks. Agree with Archana. Although expressions like ‘ball park’ figure etc seem to have entered our corporate lexicon quite some time ago. These are wonderful quotes. As I always thought, Ogilvy had a common sense approach to marketing which transformed selling a message into an artform . Even if we hold all the prospects for a best ad campaign, and couldn’t understand target market/people, all such efforts would end up at a better flop in terms of time and money. This article clearly says that. Thank you. Claude Hopkins is the Father of advertising. This is great. My favorite thing about Ogilvy was how he managed to merge his analytical and creative thinking in a way to produce incredible results. There’s a spectrum that runs from the stereotypical, disorganized “creative” and the regimented, lifeless “orderly.” Finding a balance between the two is something I work on every day to take my business to the next level. It seems so simple but makes so much sense. I have had a lot to do with Robert Cialdini lately, recently completing his Principles of Persuasion course. Cialdini studied human behaviour and researched how people got other people to say “Yes” or influence and formed a framework around 6 principles of persuasion he invented. I could really relate with that article Beth, having recently become an avid follower and love reading articles on persuasion and the like. One thing I learned very quickly. Always leave them wanting more and they always come back. The first business book I ever read was when I was a teen “Confessions – Ogilvy on Advertising” … his words and methodology are still used as examples today for many creative types. I am so glad that I studied the works of Edward Bernays previously as this article on Ogilvy helps me bring the two halves together. Who would’ve thought focusing and speaking to one reader at a time creates such a powerful effect? Excellent! Everyone seeking to create can find insight in this article – thank you!